55 lb. 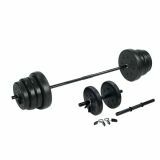 traditional weight set-heavy-duty vinyl weights. Includes 2 10lb., 2 5lb. weights, 2 locking spring clips, 1 straight bar with textured grips. Cando® ErgoGrip Hand Exerciser is sold in pairs. Weight equals the amount of force needed to fully compress the fixed ErgoGrip handles. 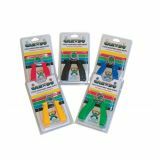 The new Cando® resistance sequence on these ergonomic grips covers any needs from the earliest stages of rehabilitation after stroke to advanced athletic training . The force equivalent doubles with each level so you can work your way up. 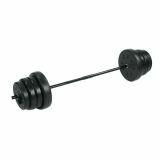 CanDo® vinyl-coated cast-iron dumbbells, 10 lb. 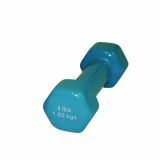 vinyl-coated, color-coded cast iron dumbbells are ideal for upper body exercise, coating gives weight comfortable feel and will not scratch floor, vinyl-coated dumbbells are easy to clean, vibrant color weights are clearly marked in lb and kgs. 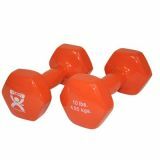 CanDo® vinyl-coated cast-iron dumbbells, 4 lb. 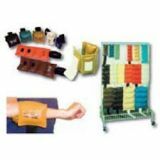 The Cuff rehabilitation wrist and ankle weight has been proven effective in hospitals for over 30 years. It contours to snugly fit the ankle, wrist, and even thigh. Its long velcro closure strap assures a secure and comfortable fit even during the most strenuous exercise program. It features heavy-duty materials and double-stitching throughout. 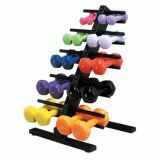 The Cuff exercise weights are color-coded, marked with both pounds and kilograms and grommeted for hanging on any peg-board weight rack. 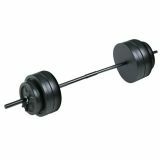 Dumbbell weight rack holds up to 20 vinyl coated dumbbells. 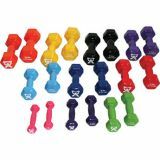 Vinyl coated, color-coded cast iron dumbbells are ideal for upper body exercises, or for physical therapy, weight training, and toning workouts. Vinyl coating gives weight a comfortable feel. Coated weight does not scratch floor. Clearly marked in pounds and kilograms.